I live in a locale that has short seasons and lots of hail. The solution? 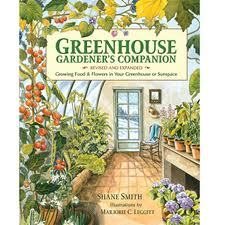 Grow tomatoes in a greenhouse. To be successful you must grow indeterminate varieties that grow in a more vine-like manner rather than in a bush. That way I can take advantage of my airspace for higher yields. Because tomatoes don’t have tendrils to climb a trellis, I train them to grow up some twine suspended from my rafters. I simply twist the tomato vines up the twine as they grow. This year I am growing mostly tomatoes that I have grafted for greater vigor and am having great success. Each morning, I venture into the greenhouse to gently shake each plant which helps to promote pollination. We use our ripe tomatoes in making caprese salad and we also dehydrate a lot of tomatoes for winter pizza’s and other Italian dishes. I find that dried tomatoes (when you use homegrown ripe tomatoes) are a whole different and tasty animal and are preferred over winter grocery tomatoes.